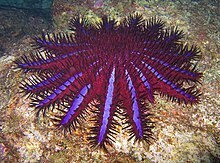 For the scientific journal, see Marine Biology (journal). An albatross hovering over the ocean looking for prey. 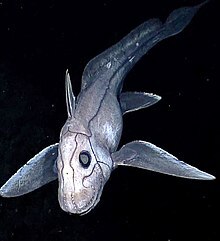 A deep-sea chimaera. Its snout is covered with tiny pores capable of detecting animals by perturbations in electric fields. ^ Charette, Matthew; Smith, Walter H. F. (2010). "The volume of Earth's ocean". Oceanography. 23 (2): 112–114. doi:10.5670/oceanog.2010.51. Retrieved 13 January 2014. 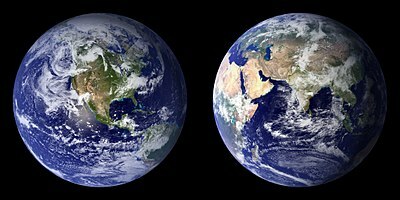 ^ World The World Factbook, CIA. Retrieved 13 January 2014. ^ Oceanographic and Bathymetric Features Marine Conservation Institute. Uploaded 18 September 2013. ^ Foley, Jonathan A.; Taylor, Karl E.; Ghan, Steven J. (1991). "Planktonic dimethylsulfide and cloud albedo: An estimate of the feedback response". Climatic Change. 18 (1): 1. Bibcode:1991ClCh...18....1F. doi:10.1007/BF00142502. ^ Sousa, Wayne P. (1986) . "7, Disturbance and Patch Dynamics on Rocky Intertidal Shores". In Pickett, Steward T. A.; White, P. S. The Ecology of Natural Disturbance and Patch Dynamics. Academic Press. ISBN 978-0-12-554521-1. ^ Leroi, Armand Marie (2014). The Lagoon: How Aristotle Invented Science. Bloomsbury. pp. 72–74. ISBN 978-1-4088-3622-4. ^ Gmelin S G (1768) Historia Fucorum Ex typographia Academiae scientiarum, St. Petersburg. ^ Silva PC, Basson PW and Moe RL (1996) Catalogue of the Benthic Marine Algae of the Indian Ocean page 2, University of California Press. ISBN 9780520915817. ^ "A Brief History of Marine Biology and Oceanography". Retrieved 31 March 2014. 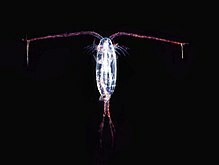 ^ "Functions of global ocean microbiome key to understanding environmental changes". www.sciencedaily.com. University of Georgia. December 10, 2015. Retrieved December 11, 2015. ^ Suttle, C.A. (2005). "Viruses in the Sea". Nature. 437 (9): 356–361. Bibcode:2005Natur.437..356S. doi:10.1038/nature04160. PMID 16163346. ^ Sea snakes[permanent dead link] at Food and Agriculture Organization of the United Nations. Accessed 7 August 2007. ^ Pritchard, D. W. (1967). "What is an estuary: physical viewpoint". In Lauf, G. H. Estuaries. A.A.A.S. Publ. 83. Washington, DC. pp. 3–5. ^ McLusky, D. S.; Elliott, M. (2004). The Estuarine Ecosystem: Ecology, Threats and Management. New York: Oxford University Press. ISBN 978-0-19-852508-0. ^ NOAA (1998) Record-breaking coral bleaching occurred in tropics this year. National Oceanic and Atmospheric Administration, Press release (October 23, 1998). ^ ICRS (1998) Statement on Global Coral Bleaching in 1997-1998. International Coral Reef Society, October 15, 1998. ^ Bryant, D., Burke, L., McManus, J., et al. (1998) "Reefs at risk: a map-based indicator of threats to the world's coral reefs". World Resources Institute, Washington, D.C.
^ Goreau, T. J. (1992). "Bleaching and Reef Community Change in Jamaica: 1951 - 1991". Am. Zool. 32 (6): 683–695. doi:10.1093/icb/32.6.683. ^ Sebens, K. P. (1994). "Biodiversity of Coral Reefs: What are We Losing and Why?". Am. Zool. 34: 115–133. doi:10.1093/icb/34.1.115. ^ Wilkinson, C. R., and Buddemeier, R. W. (1994) "Global Climate Change and Coral Reefs:Implications for People and Reefs". Report of the UNEP-IOC-ASPEI-IUCN Global Task Team on the Implications of Climate Change on Coral Reefs. IUCN, Gland, Switzerland. ^ Seven Miles Down: The Story of The Bathyscaph Trieste. Archived 2007-02-02 at the Wayback Machine, Rolex Deep Sea Special, January 2006. ^ "Aphotic Zone | Encyclopedia.com". www.encyclopedia.com. Retrieved 2018-12-06. ^ "March 2014 Newsletter - What's Going on at Desert Star".